By all accounts, Nike is a major innovator in sneakers and sportswear. And if their new exhibit at the Milan Design Expo 2016 was any indication, they got there through some pretty out-of-the-box thinking. 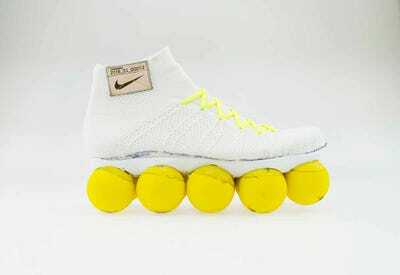 Starting with the company’s proprietary “Flyknit” shoe upper — a kind of stretchy woven fabric that allows the foot to flex and expand in the shoe — the company has envisioned what could make up the bottom of the shoe in the future. And the answer ranges from hair curlers to a map, and includes everything in between. 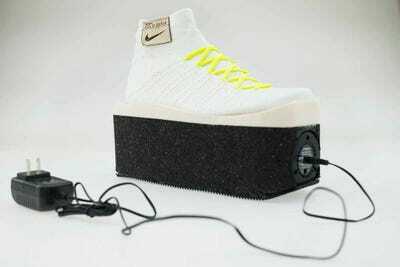 Called “The Nature of Motion,” the exhibit is meant to “manifest the previously unimaginable” to find out what the future of athlete footwear really could be. 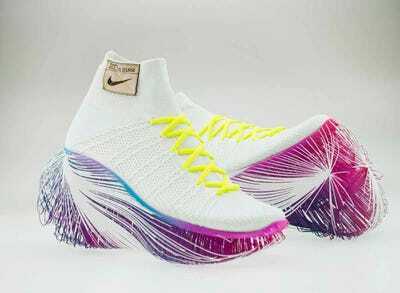 In 2020, when you’re wearing sneakers with cat whiskers on it, you’ll know where that idea come from. 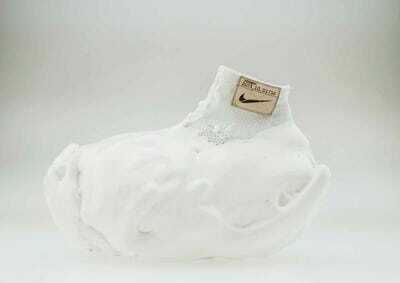 This shoe was dipped in many layers of PU foam, which will never fully compress no matter how hard the athlete runs. It eliminates the feel of the impact of the foot on the ground. A 'gliding convex outsole' on this shoe uses natural momentum to launch runners forward. 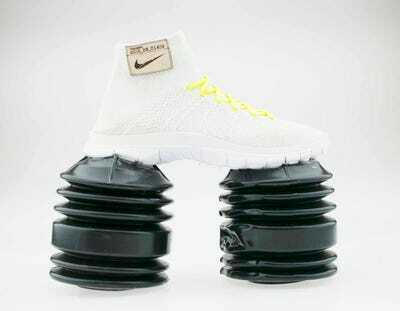 This design uses plungers on the shoe to lessen the impact of the foot on the ground, as well as suction to slow the runner's pace. 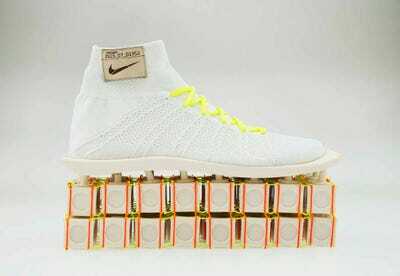 Inspired by Nike's first employee, Jeff Johnson, this shoe attempts to mimic the feeling of running on pine needles. Wrapped around these shoes for impact protection are plastic bags filled with kinetic sand for an adaptive cushioning system. Running on bouncy balls looks uncomfortable, but there would be a great return of energy for the athlete. 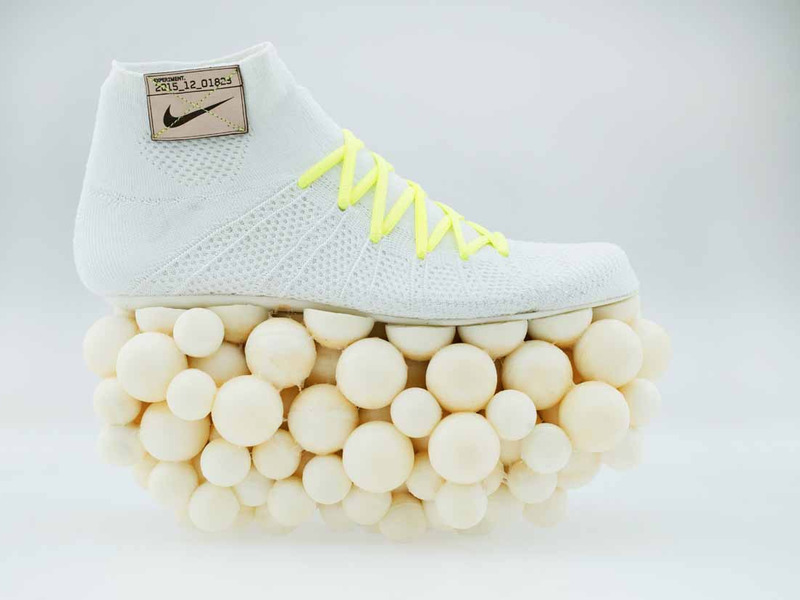 Foam toe separators don't look like they belong on a shoe, but Nike says they can form a customised 'segmented cushioning system' that can expand and contract on impact. 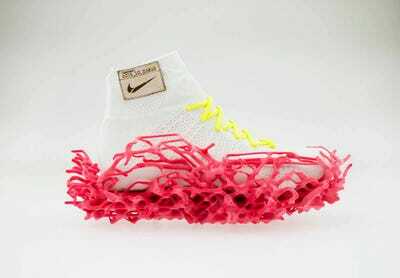 This 3D-printed outsole was based on a pressure map of the foot, and flexes when the shoe hits the ground. 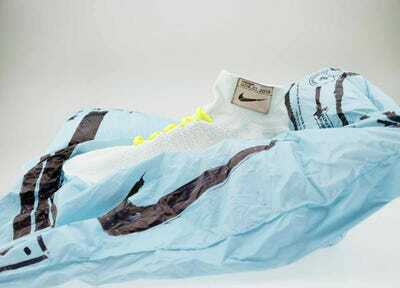 'In this design, Airbags underfoot capture and release air, putting the cushioning exactly where you need it as you run,' according to Nike. 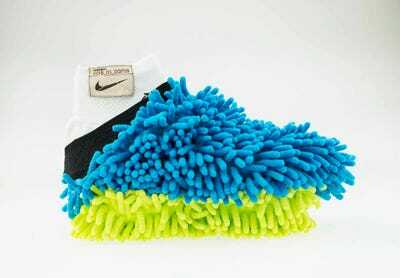 Described as a 'cheeky design' by Nike, this puts a mop under your foot as a cushion. It also 'sends a subliminal message to the competition: I'm going to wipe the floor with you!' Nike says. A more practical take on the shoe with a full line of bouncy balls, this model uses only a few more flexible balls, which increases compression and uses 3D printing to enhance stability. Walking on rocks may sound like a terrible idea, but it's drawn from the cobblestone reflexology paths found in Taiwanese gardens, which are said to improve health and well-being. 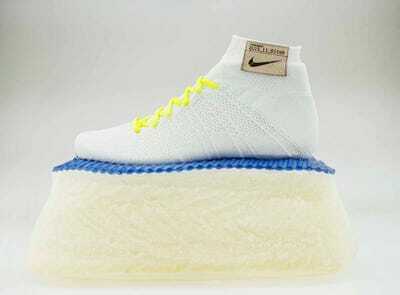 This might look ridiculous, but the spring cushioning system of polymer noodles condenses down to a normal height once the wearer straps into the shoe and steps down. 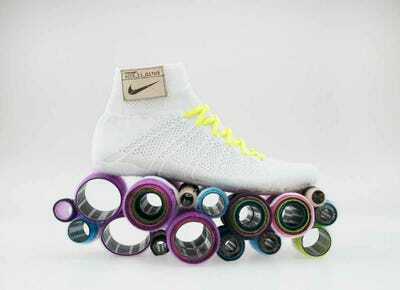 Made from Velcro hair rollers, this design incorporates a cheeky take on an outsole that can be adjusted to an individual athlete's needs. 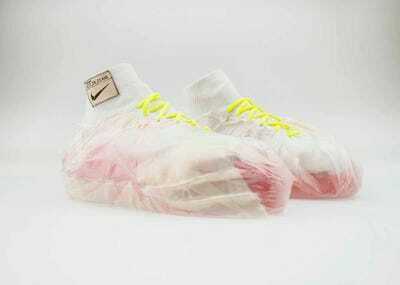 Brightly coloured fluid fills these airbags, which creates a naturally adaptive underfoot cushion. 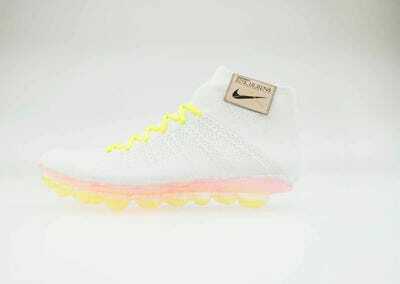 Champagne packaging may seem an unwieldy sole for a shoe, but, since when shaken it produces foam, it can grow around an athlete's foot, creating a custom cushioning system. This design takes advantage of the tension magnets can create to see how it can be used to cushion an athlete's run. Memory foam isn't just for pillows anymore. 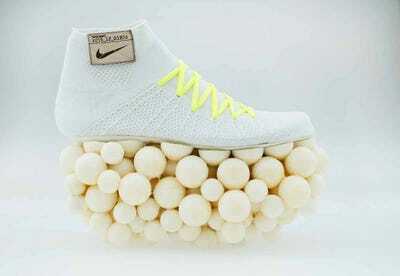 Instead, in this design it forms a malleable cushion that allows a slow compression as the athlete runs. 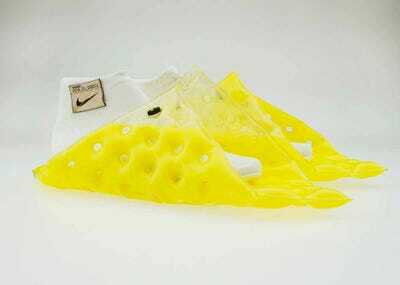 Expanding on the memory foam idea, this one also includes a cooling gel in between the insole and memory foam outsole. 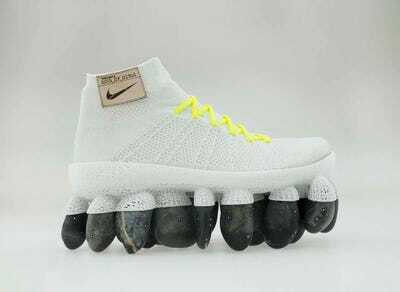 This shoe isn't for running. Instead, it's a plug-in vibrating outsole that is designed to help athletes recover after runs. 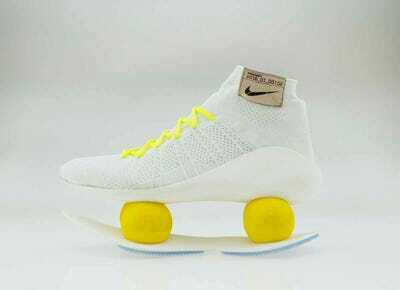 This shoe is designed to encourage the wearer to 'embrace instability' with independently compressing foam spheres that are designed to lessen the impact of the foot on pavement, and spring back quickly to increase energy return.